Spring is a real special time of year for farmers. It’s nice to have the cold snowy winter months behind and to be looking forward to planting seeds in the ground. As the temperature warms up, farmers start to look to the fields wondering how soon they can start to do their spring planting. I believe a farmer’s blood gets flowing through his veins faster when it’s time to get to the fields with his planting equipment and seed. I know mine does! I always look at the seeds that I plant as small miracles. It always amazes me how I can take a few bags of seed out to a field and plant them in the spring and then in the fall reap such a bountiful crop. It is truly a miracle of God to have such a multiplication of the seeds that were sown. I usually work the ground first, getting a nice seed bed, and then I go back and plant it. Over the years on occasion I have run out of daylight before I have finished planting a particular field. For me though that generally isn’t a problem, I can turn the lights on on my tractor and keep going until I get the field done. When that happens to me, I always think back to my Grandpa. For the first twenty to thirty years of his farming career he used horses. That was pretty much before the days of tractors. So what did farmers do back then when it got dark on them when they were planting a field you ask? They would head their team of horses home and hope it won’t rain in the night. If it did rain in the night they would have to go back and rework the part of the field that wasn’t planted and then finishing planting it. A lot of extra work. But my Grandpa was the exception to the rule. He told me that darkness didn’t stop him from finishing a field. My Grandfather had a special helper that always helped him after dark so that he could always finish the field he was working on. And no his helper did not have a flashlight or lantern either. And Grandpa never paid him overtime wages. Who was this exceptional worker you ask? His faithful loving white farm dog! When the neighboring farmers would head home at dark, Grandpa would stay out in the field with his horses and dog till he finished the field. Grandpa had his dog trained to run along the edge of what was already planted and the horses knew to follow just off to the side of the dog. The horses and the dog got along perfectly and since the dog was white, the horses could see him to follow him even on the darkest nights! Grandpa said he finished planting many a field that way. The neighbors always shook their heads in disbelief, but what was planted in the dark looked just as good as what was planted in daylight. No skips or gaps or overlapping to speak of. The dog, horses and Grandpa always knew just what to do! In the middle of the night when it stormed, they all slept well knowing they had the field all planted. They worked in perfect harmony. Grandpa and his team worked excellent together and accomplished more than could be expected because they worked in harmony, each doing their part. On the farm here, I have often been amazed at how much we can get done in a day when we as a family work in love and harmony with a common goal in mind, each of us doing our very best. 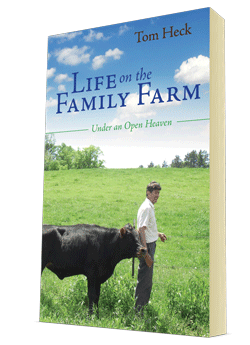 I have seen many families over the years, farm and non-farm alike, that live and work in strife and confusion. How sad this is, since it doesn’t have to be this way. It is so much better to walk in the love of God and in harmony with one another. It builds the most wonderful relationships imaginable and makes life really worth living. Even Grandpa’s horses and dog were living proof of that!